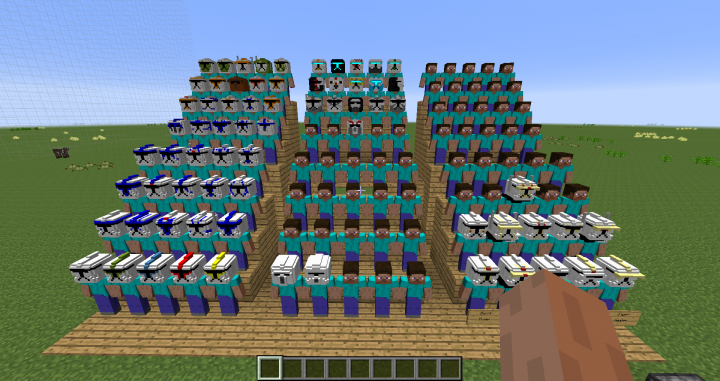 Update 0.0.5 Alot of armors added, and a couple full armors. 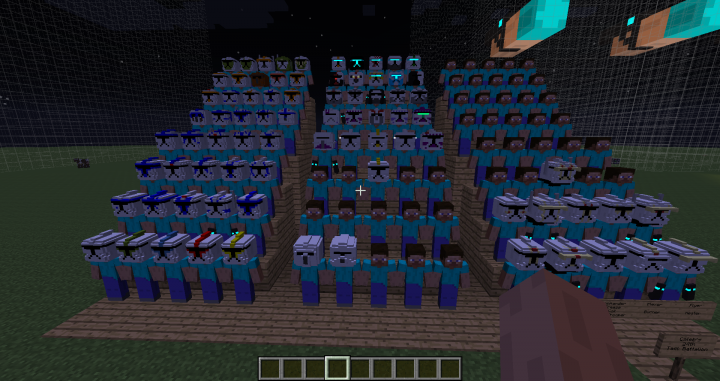 Update 0.2.0 I have made 20 different versions since the last and havent posted them. i am very sorry. Comment down below some clone ideas and then give a description of what the clone would llook like, and its name and if its gonna be multipul clones give a battalion worth of troopers including officers, and troopers, and arcs, arfs, and all those things, and give names, and the division name and its number such as: 288th Jedi Clone Battalion. in which your suggestions will NOT go to development itll just be something for you guys to look forward to. also i would like to thank you for 150 downloads and all your views!!! also i still have SG , RG , KS , and a bunch more to do XD. OK 1.2.1 IS REALEASED! I couldnt think of ideas for stuff. BUT NOW I HAVE STUFF! and here is a contest for yall! Whoever finds the 2 new items, and comments what they are, the first 3 to do so will get a clone armor made based on them, so with your comment of the items, do another sentence explaining what you want your armor to look like, number 1 place gets an entire division. so number 1 person comment instead of a soldier idea comment your division name, number, what soldiers colors are, what they look like, who the commander is and his name, and I will also feature you when I get my armourers workshop content packs channel! This is a mod that is for basically just role-play armor for armourer's workshop. I am posting a picture with the mod so that you can see the combinations cause there's accessories that are not assigned so hopefully you can tell who needs what accessory. 24th Is Not An Official Star Wars Division It Is Mainly Cause I Wanted A Battallion Based On Heat. 2nd Download Armourer's Workshop If Not Already Done. 4th Put Clone-Armor-0.0.1 Into Folder Armourer's Workshop Found On .Minecraft where you would normally get to saves and mods and stuff. 5th Click Play on 1.7.10. Play With The Armor Make A Role-Play Server. Note: Please Give Credit To Me If You Are Using This In Video's and A Download Link. And Give Credit To Me On Servers. This Is 1/10 Done So Don't say I would like more or something. GO TEAM PEWDIEPIE!!! IF YOU SEE THIS POST JOIN TEAM PEWDIEPIE!!! GO TEAM PEWDIEPIE!!!! LOVE YOU PEWDIEPIE!!!!!!!!!! people diamond my stuff but never subscribe.